These still need a lot of work before they're usable: Saint_Jiub has spruced up the textures (everything you're seeing here is Saint_Jiub's work), but the models are simultaneously too wasteful with polygons and too featureless: all the detail is presented in the texture, none in the shape. 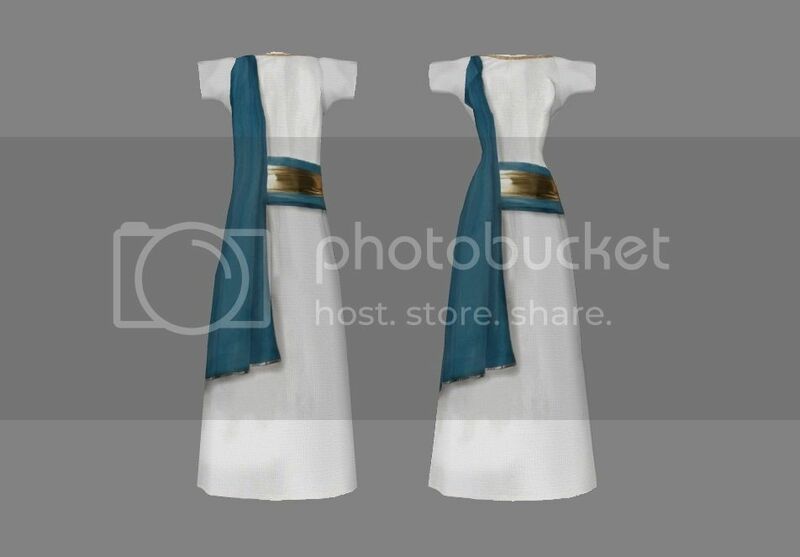 There are also texture issues with the second, third and fourth robe: the female version of 02 has not been updated, and the white cloth for the others seems washed out: especially 03, which is a little too purple. Saint_Jiub, could you fix these issues if you have the time? One other thing is the armor for the religious knightly orders. My idea is to dress these in slightly edited/alternative versions of existing iron, steel, leather or silver armor - sort of the way that different versions of Bonemold in Morrowind have political connotations. An example would be this silver cap I've made as a concept piece. 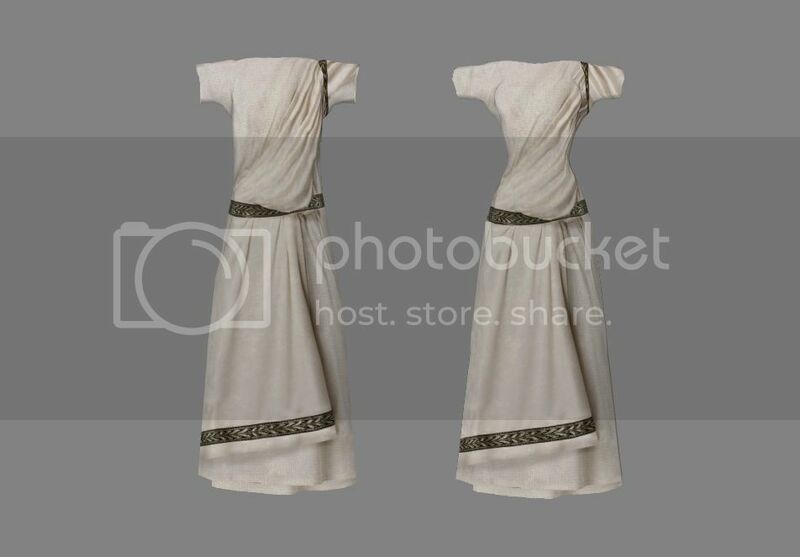 Along with an silver cuirass and a skirt using the same cloth texture, this could be a full uniform for the Order of the Lily. Getting robes imported, edited and exported functioning is almost a science in itself. If you don't succeed in it, I can give it a go, as I have often been in the position of having to import and export stuff like that and I have found a technique to get these things to work. These look much better now that they have been redone. I'll definitely take another look at the textures. Adamantium for Akatosh: mythic connection there. Silver for Dibella: the "prettiest" armor seems like a better fit. Domina is kind of a weird set, and a lot of people dislike it: we'd do better to avoid it. Templar armor for Talos: he didn't feature in Daggerfall, so there's no knightly order associated with the cult. I was thinking of making the Red Templars pull double-duty here. Nice one on the Adamantium, forgot about that as an option. We need something unique for Mara as well... maybe ringmail for her knights and something based on newtscale for Arkay (tying into his river associations)? I do like the idea of integrating the domina set into our world though (since that helmet definitely has an Imperial vibe to it)... maybe put it in a few of our brothels? Gold for Mara? Sort of a harvest association. And I really like the face mask on gold armor. I mean, lose the high heels and replace the helmet with a hood and you basically have Oblivion's Dark Brotherhood armor I do agree that it doesn't fit for a knightly order, but I don't think we need to go crazy with Daedric influences or anything. Gold would work for Mara, we should concoct some kind of folklore or mythology around that face on the chest though, maybe a spirit loyal to Mara? Moranar completed the set, btw, and converted it to BB a while back, so if we do go with gold we should use that as a base. The robe import-export business seems to work, but I'm wondering what the best policy is regarding assigned body parts. 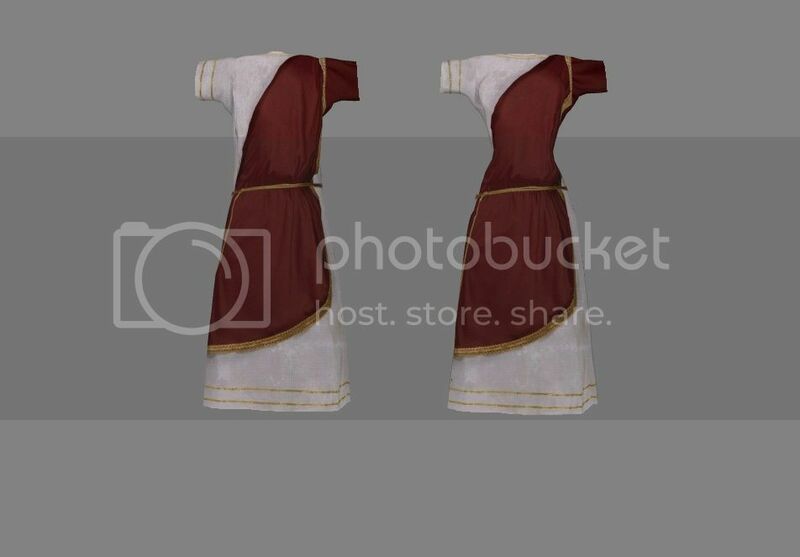 Normal robes use the chest part, but these BB meshes are attached to the right forearm (so that they can show skin around the collar, I assume). I've looked at Illy's original mod and it seems she used some kind of dummy item hack to get them to work. I'm wondering, what would be the best way to set this up? We could use groin for them, but I cannot get your robe to work nevertheless. It simply doesn't show up on the npc regardless of the body part being used. I haven't had time to look closer, though. I'm sorry, should have added a test .esp. I've gotten it to show using the right forearm and in conjunction with Better Bodies. We'll want to make sure that all of our meshes come below the ankle slot, since the upper leg and knee will be rendered invisible when we set them up as robes. Otherwise the shorter ones can be set up as shirts instead. Interesting solution. Hiding all visible parts of the chest seems to be the easiest option, but I don't see it working out in the long run: it will be a lot harder to do with the second robe, for example. EDIT: I've made the robe a skirt and assigned it to the right clavicle for now, which makes it appear in-game. Apart from some minor clipping, I've seen no serious problems: import and export went without a hitch, bone weighting works, etc. The big problem is with armor mixing: cuirasses and greaves clip through the robe. Just have to find the right way to rig this up. 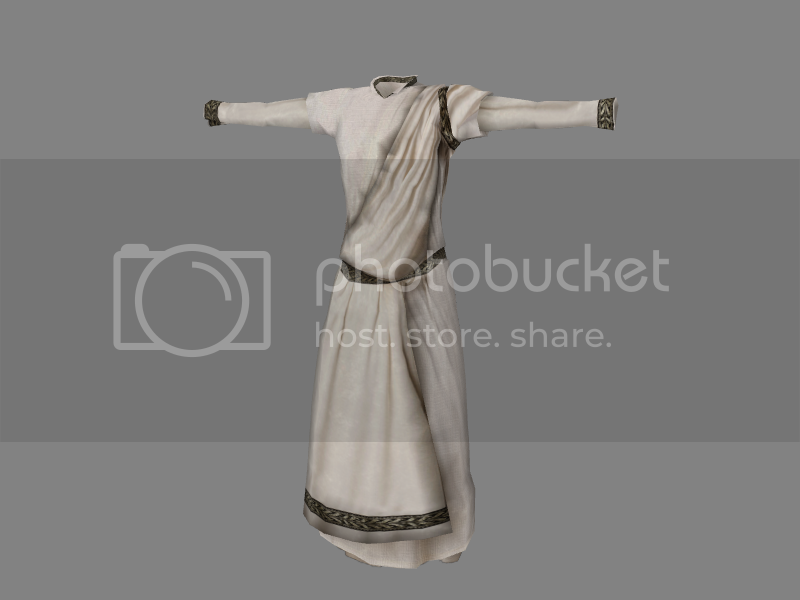 Turn it into a normal robe: this means closing the collar and lengthening the sleeves, because robes by default occupy the chest, upper arm and elbow pieces (making them invisible). 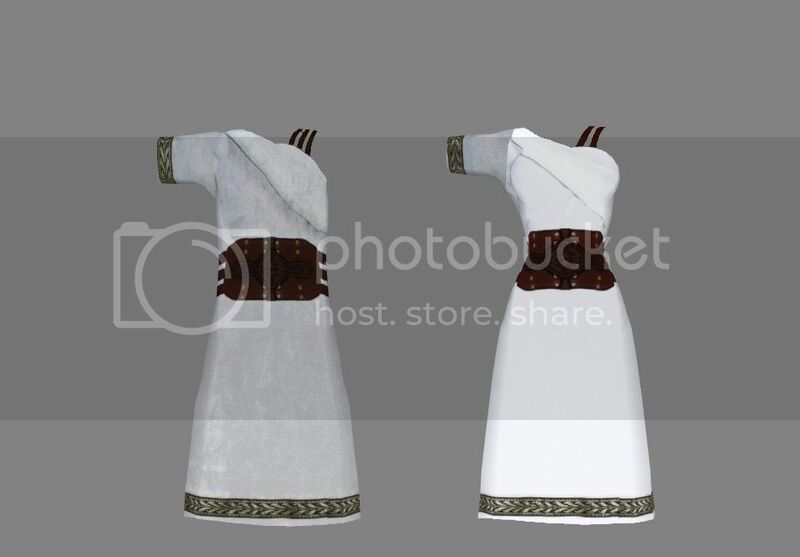 This works best with armor: things like cuirasses and greaves will be hidden underneath the robe. This is what Saint_Jiub did with his edit, though I would prefer to sculpt these details directly into the base mesh (saves on polys). The downside is that the mesh loses some of its uniqueness, like the short sleeves. Split it up in a shirt and skirt combo: probably not as difficult as it sounds, and it would allow me to save the short sleeves and maybe the exposed chest. I may try this anyway for the second robe. 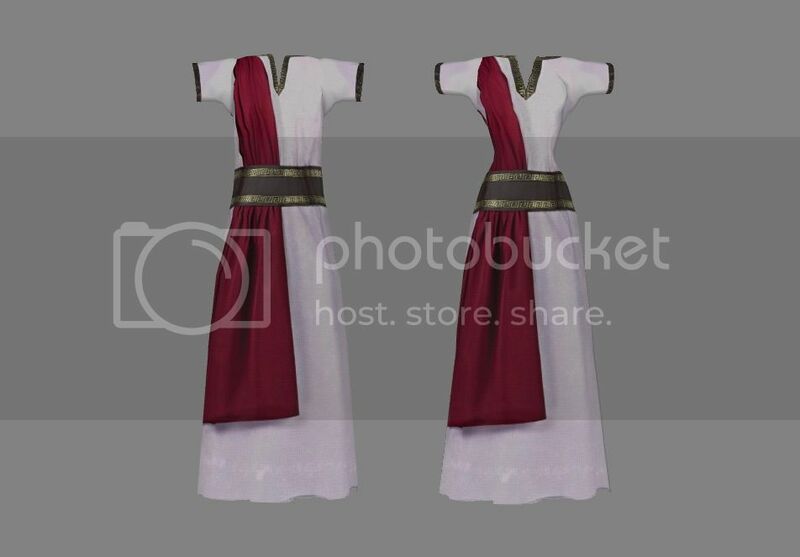 Downside: it's not really a toga anymore, and the pieces may look weird when worn alone. Man, I am learning a lot. Two days ago I had no notion of weight painting whatsoever. There's something I'm messing up in this robe business. Can't get the model to show in-game, which is weird because it is based on the one Saint_Jiub posted, which does seem to work. Jiub, could you take a look at it and share your many secrets? Here's a screenshot of what the robe looks like right now + a screenshot of a WIP Silver armor proposal for the Knights of the Lily. What do you think? Can't test in game just yet but what I'm going to try is renaming the NiTriShapes, they should start at Tri Chest 0 and go sequentially from there, if it doesn't see 0 then it won't be able to display 1-4. My new machine is still a work in progress, I'll get MW installed so I can test it in game. Dibella armor looks great, my only recommendation would be white or pale pink fabric to solidify the lily connection. Ah! That's probably it, then: I imitated everything of your test file's node setup except the numbering of the pieces. I'll try it immediately. Good call on the colors and patterns. Perhaps we should associate certain color combinations with certain Divines. 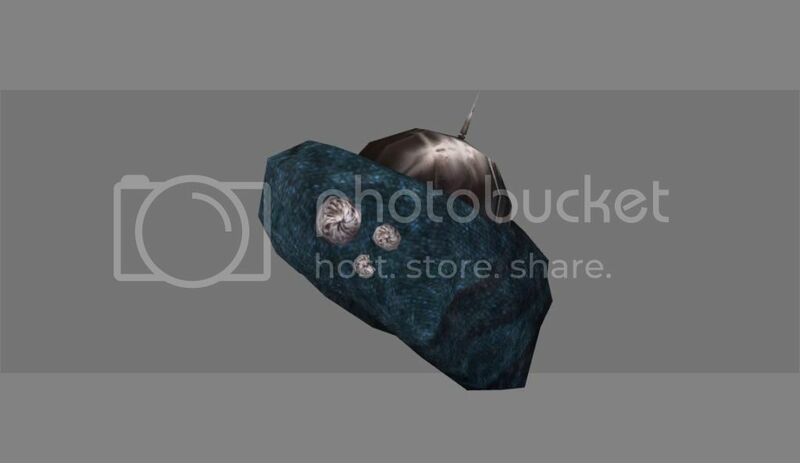 These could manifest in clothes, interior lighting, banners and depictions, etc. A coherent theme, so to speak. EDIT: it works! Thank your, Saint_Jiub! Made a helmet to go along with the new cuirass: https://www.dropbox.com/s/59xny39oa7yjz ... t.png?dl=0 I feel like it's still missing something, but I'm not sure what yet. Well, this is awkward. I really like your helmet, though, it has that temple guard feel to it. 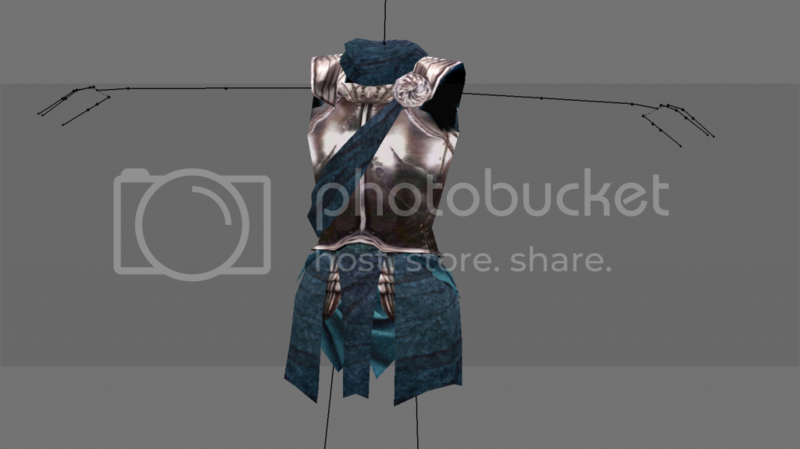 I would add a bit of cloth in the same color as the cuirass to make it a coherent set of armor, maybe between the helmet and the face mask, or as a kind of veil on the lower half. EDIT: this is probably a bit rude, but would you be up to sharing your helmet, Saint_jiub? I have a couple of idea I's like to try out.